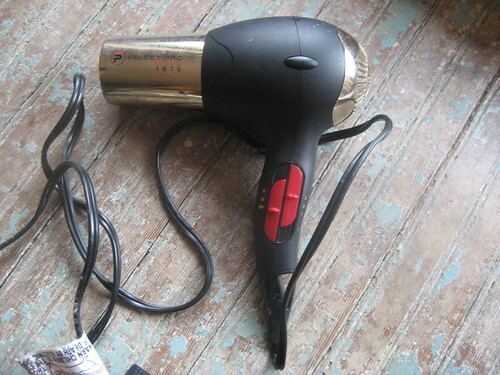 My last post discussed my need to trust people and the garage sale purchase of a hair dryer that no longer warmed the air. Many of you shared your feelings about the seller and a few of you had suggestions for alternate uses. Hot flashes would appreciate this hand held fan, I am told. David came up with a possible "excuse", if you will, for the seller. Perhaps, he suggested, the lady's young adult daughter (or son) moved out of the house and left the defunct dryer behind. 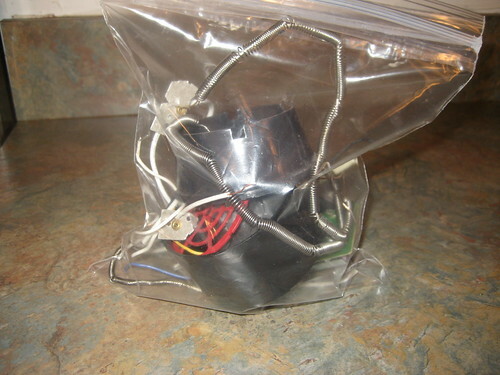 Perhaps Mom was cleaning out the cabinet and located the apparatus. Perhaps Mom plugged it in, heard the appropriate noise and said to herself, "Why did that child leave this perfectly good hair dryer behind?" Thus, the "I just want to get rid of it" one dollar price. It could happen! Now, don't we all feel bad for not giving her the benefit of the doubt? ha! What, you ask, will we do with the parts? Well, I am thinking we just got ourselves some Junk Pumpkin parts. Maybe a little something like this will happen in the fall with our new found junk. David and I feel good about what we ended up with. There are happy endings, after all! Mindy, that sure was a happy ending. Love those kinds of stories. Oh, and that blanket box is fabulous! two sides to every story! 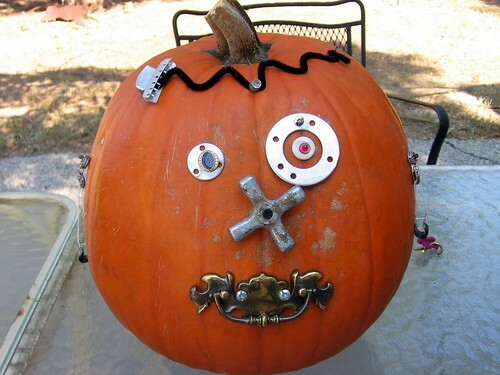 those parts will come in real handy for your next junk pumpkin fest! perfect! You are a true junker! Great idea! Oh My Mindy ..I had this same thing happen not too long ago ...with a toaster oven ...it works but it scorches everything ..I'm not into burnt toast or really any burnt food ...LOL !!! 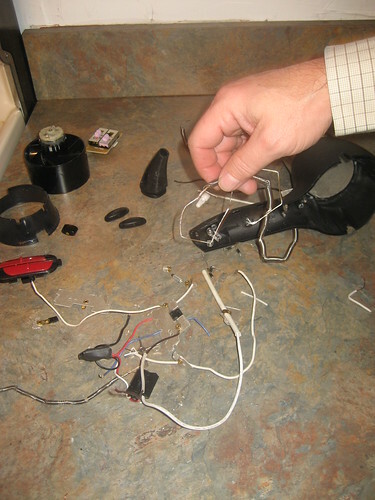 Hey maybe you could use the motor for something creative ...Maybe google uses for hair dryer motors and see what comes up ...I personally have always wanted to know how to motorize things ..and I'm always seeing shows where they use the motor from this or that to create some cool thing ..maybe motorize the nose or eyes on your pumpkins ??? You amaze me!! Love your happy ending after all very creative and love the recycling part of it. Ok and the blanket box is a real gem. Thanks for always stopping by with your kind words. Have an amazing week!!! Great job putting a positive spin on it! Great that you found the silver lining and for a buck, that's pretty easy. Just love those awesome junk pumpkins! That is just too cute!!! I'm glad you got some use out of it. Clever ideal. Junk Pumpkins! I love it and I love your story...a perfect ending. Great save Mindy. Yep I've gotten lots of stuff that Wasn't exactly what I thought it'd be. But for a buck one can't get too upset. A cup of coffee costs more than that. Mindy, thank you for the sweet comments on my blog. You are such a doll! Love it! But, I have to know is that a real pumpkin a live and well in the middle of January? Thats amazing!! Ah ha! Perfect! Proving, once again, that there's no such thing as trash. Smarty smart girl and David! see...this made you an even better creative junker! Sometimes you can over-think it. It was a gift, n'cest pas? Oui!